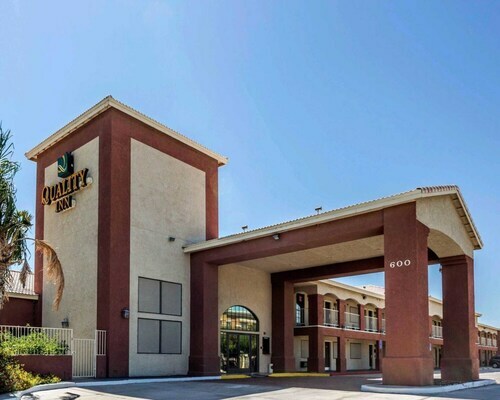 Situated near the airport, this hotel is within 1 mi (2 km) of Blythe Area Chamber of Commerce, Palo Verde Historical Museum, and Todd Park. Blythe Municipal Golf Course and Mayflower County Park are also within 9 mi (15 km). 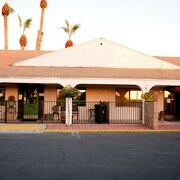 Situated near the airport, this motel is within a 15-minute walk of Blythe Area Chamber of Commerce and Palo Verde Historical Museum. Todd Park is 1 mi (1.6 km) away. Situated in Blythe, this motel is within 2 mi (3 km) of Palo Verde Historical Museum, Blythe Area Chamber of Commerce, and Todd Park. Mayflower County Park and Blythe Municipal Golf Course are also within 9 mi (15 km). 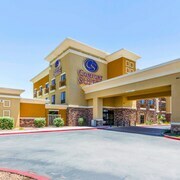 Situated in Blythe, this golf hotel is within a 15-minute walk of Blythe Area Chamber of Commerce and Palo Verde Historical Museum. Todd Park is 0.9 mi (1.5 km) away. Situated in Blythe, this motel is within 3 mi (5 km) of Palo Verde Historical Museum, Blythe Area Chamber of Commerce, and Todd Park. Mayflower County Park and Blythe Municipal Golf Course are also within 9 mi (15 km). 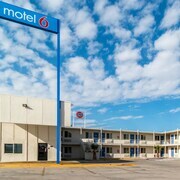 Located in the heart of Blythe, this motel is within 2 mi (3 km) of Palo Verde Historical Museum, Blythe Area Chamber of Commerce, and Todd Park. Mayflower County Park and Blythe Municipal Golf Course are also within 9 mi (15 km). Are you looking for a break from the hustle and bustle of your day-to-day life? Do you want to escape reality and forget about your never ending to-do list? Then why not treat yourself to a relaxing stay at one of the spa hotels in Blythe? Whether it is for a weekend getaway or a staycation, book your visit to one of the Blythe luxury spa hotels. With all of the amazing things to do around Blythe, you will likely be worn out from sightseeing. 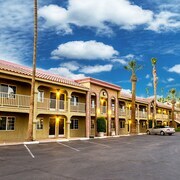 The Blythe spa hotels provide top of the line facilities with hot-tubs, saunas and private treatment rooms. Treat yourself to an indulgent hot stone massage or facial to rejuvenate from a busy day. If that's not enough for you, indulge in a full day-at-the-spa package. And maybe you are just looking to reach maximum relaxation before a fancy night out on the town. Take advantage of the salon features offered at most Blythe spa hotels and get a mani-pedi before your evening begins. 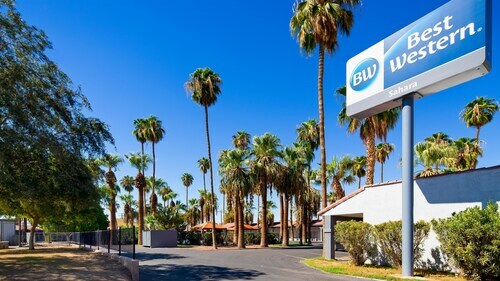 Travelocity wants to help you relax and rejuvenate during your next stay in Blythe, but we know that spa treatments can put some strain on your wallet. Bundle your hotel and flight together and save enough to pay for your facial! Nice accommodations in a good location! Room was nice and clean. There is no restaurant here, no working hot tub. Two reasons I chose this hotel. Also the breakfast was toast and 2 kinds of cereal with a gallon of milk in the fridge. There were herds of knats coming out of the sink drain. Other than that....beds were fine. Nothing in Blythe worth staying at. 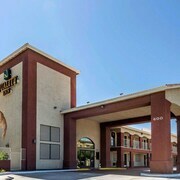 Staff was friendly and the hotel was clean and comfortable. They were great and booked additional nights for us and honored the Travelocity amount for the entire stay. 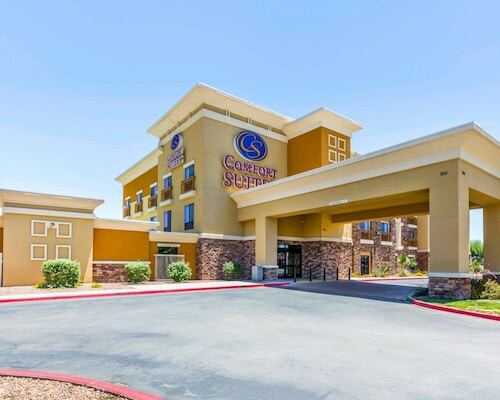 This Hampton Inn is relatively new to Blythe. It is conveniently located to the Interstate. The reception and cleaning staff was pleasant and efficient. The complementary breakfast was good and kept well supplied. The rooms were good sized, quiet, clean and well furnished and featured a large TV, a microwave and a small refrigerator. The beds were comfortable and the bedding was clean. All in all, the Inn was a great value for its price. 2.0 Dogs or No Dogs? Seems like this is a 'no dog hotel' and I even heard the front staff remind people of this while handing them keys but I saw 4 dogs at the hotel (and who knows how many were there that I didn't see). On the second day there (after a very long drive the night before) we were woken up by dogs barking, yelping and howling. This lasted on/off 1 1/2 HOURS. I finally called front desk. They asked what room and I told them. Few minutes later they called back and said that guest said they didn't have dogs and I need to recheck room number. I look, there was only 1 other possible one and I tell them. 20 minutes later dogs were howling again. I walk out to my car for something and coming back see housekeeping cleaning the other room and dogs barking and clawing at the window, trying to get at the housekeeping. I call the front desk again. They said they know and the woman is up there now! Seems she was all mad she was caught and left. That didn't stop at least two other dogs being there. So, seems like it is okay unless guests complain. Also, Jarred seemed very nice but clueless and too new! Needs more training or more sleep! 1- he couldn't find our voucher and made me call Travelocity. 2- I asked for a room on a corner that was QUIET. He put in in middle of 'V' -ish shape so we had room on each side and one in front of us. I told him my 90-yr-old grandma would be visiting room. Room was hard to get to from car, long walk or across gravel which wasn't possible. RV Rental At River Resort Standard Section. Ask About Pet Friendly Units!